The post-Easter season has been somewhat quieter for Tenebrae, following our USA tour and Holy Week residency at St John’s, Smith Square. The Associate Artists have, however, been kept busy with various educational workshops and concerts. We travelled down to Millfield School in Somerset to repeat our World War I programme featuring music by Gurney and Bingham, the wonderful Parry Songs of Farewell and Schoenberg’s epic, Friede Auf Erden which we released on the Symphonic Psalms & Prayers disc in February this year (the Stravinsky on the disc is an exciting collaboration with the BBC Symphony Orchestra). The prior rehearsal in the Gresham Centre reminded us of the fantastic programme which we last performed in Aldeburgh last November, and introduced a number of new faces to the group following Nigel’s recent successful auditions. Millfield School proved to have an impressive range of facilities, including the on-site concert hall in which we performed, which boasted great acoustics for our programme: clarity and warmth. Next the Associate Artists visited Richard Frostick and the Islington Music Centre for a full day of education outreach. Rather than working with just the older choir (ages 14-18) as we have done previously we had the opportunity to meet some of the younger performers. As is the way with most learning processes, you learn best when putting skills into action. This is what Richard allowed us to do, and we took the lead for all three of the workshops, passing the baton between each another within sessions. We began each workshop with a warm-up, developing techniques introduced to us by Dom Peckham in February. The majority of this section is delivered with minimal talking; the effect is hugely increased concentration from the singers as they copy, listen and watch each cue given to them. Across the day we taught the singers some new songs, and performed to them some Byrd and spiritual song, Down to the River to Pray. Our performances opened a discussion into musical features and consort skills heard by the singers, and lead to a number of interesting questions. We returned to Islington Music Centres the following week to deliver a workshop to the older choir. I gave the students a five-minute routine to develop vocal timbre, and James demonstrated harmonics to the students to illustrate how tongue and mouth position can create overtones. We began teaching the students the Benedictus from Byrd’s three-part mass, with a view to performing it with them in their end-of-year concert at the Union Chapel in July. 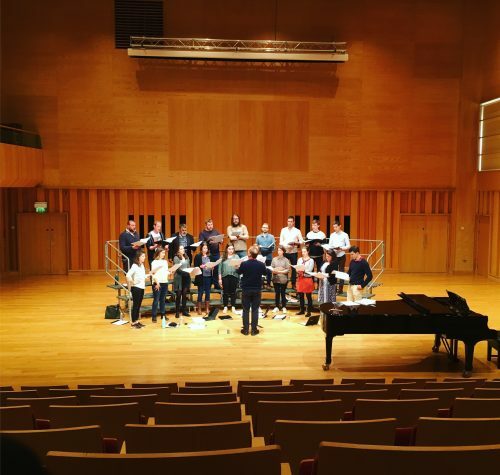 Renaissance polyphony is relatively unchartered territory in their wide repertoire, and it was fantastic to see so many young people discover its delights for themselves. We discussed the challenges of this type of music; its independent lines and long phrases interact subtly and require careful counting and listening! Later in May I was lucky enough to join the Tenebrae Consort to perform Victoria’s Tenebrae Responsories and Requiem in Germany. Our prior rehearsal took place in Eton College Chapel and we found ourselves immersed in the pre-wedding excitement (or traffic for those driving). The reason for this venue choice was so that we could also take part in the first day of the MMA Music Teaching Professionals Conference: a weekend of seminars and talks for directors of music of public schools across the country. I particularly enjoyed this as I bumped into a number of familiar faces, including Peter Tamblyn who was my DoM at Exeter School and who taught me Music A Level! Nigel ran two workshops for the professionals; the first was on Owain Park’s Footsteps which we have toured across the UK and USA alongside Joby Talbot’s Path of Miracles; the second was on Victoria’s Tenebrae Responsories which we would be taking to Germany the following day. In Footsteps the music teachers formed the semi-chorus and Nigel took them through the piece, demanding expressive text and collective breath from each individual (even those for whom singing isn’t their main study). The session culminated in a full performance. It was perhaps one of the finest versions of the semi-chorus part that we have heard this year, despite it having been put together in less than an hour. I shouldn’t be surprised though, as we were working with fifty of the finest music teachers in the country! Our second workshop was with a slightly different group of conference participants and took us on a journey through some Spanish Renaissance repertoire and focused on matching the pathos of the Responsory texts with a biting vocal timbre. We met at Heathrow the following morning to fly to Munich and travel onwards to the beautiful Regensburg where we performed in the Tage Alter Musik Festival. We were blessed with a stunning church, acoustics and appreciative audience. The 10.45pm start time of the concert was probably the biggest challenge of the performance, maintaining concentration and energy after a long day of travelling. This is perhaps one of the greatest challenges of professional freelancing: taking care to preserve vocal stamina in busy schedules. Despite the late end time of the concert, a number of us managed to find our way to the festival bar to enjoy a well-earned Pilsner. On the Sunday we travelled by train to Speyer, via Frankfurt and Mannheim. 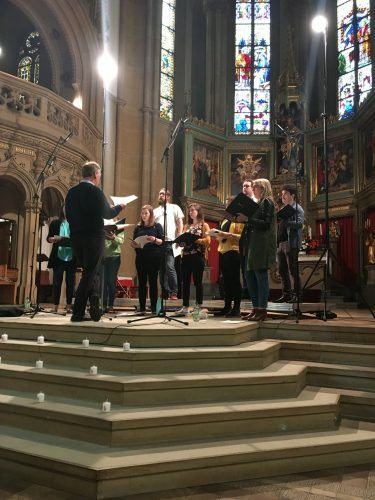 This concert was to be broadcast on German radio station SWR, so our rehearsal consisted of a soundcheck and covering the additional Responsories that we hadn’t performed the evening before. A pre-concert amble allowed us to visit the iconic Speyer Dom (now that would be a great place to perform Path of Miracles…!). Monday saw an early return to London and direct travel to Bury St Edmunds where we had the privilege of working with the Academy of Ancient Music again on a performance of Bach’s Mass in B Minor (we first performed this with them in the British Museum in November). It is such an exhilarating work to sing, particularly with small forces (3-4 per part). My colleagues’ ability to perform such fantastic solos after a tiring few days is real testament to their professionalism and talent. There we go, a really busy few days with Tenebrae after a post-Easter lull (although I’m sure Henry and Esther have been as busy as ever in the office): such is the nature of this work. It’s been fun and I’ve had a lot of great repertoire to sink my teeth into. Next up is a concert in Dorchester on 2nd June and a Path of Miracles performance in St Denis, Paris which I’m really looking forward to.